When March 4, 2019, otherwise known as “Sarachek Selection Monday”, arrived and the seeds of the tournament were revealed, the Lions were determined to become the Tier II Champions. Coach Weissberg even offered a great incentive to encourage the team to play their best – if they went undefeated, they would be able to pick his baby’s name. Right from the start of the tournament, it was noticeable that the Lions came to play and were not going to back down from any challenge they faced on the court. On Thursday, March 14th, the Lions started the tournament strong against Hillel of Pittsburgh. The Lions began the game on a 9-0 run and they didn’t look back. Although their opponent made strides and the game became a closer contest, the Lions continued to add to their insurmountable lead and ultimately secured the victory. The next day, MTA faced off against Beth Tfiloh in a very memorable game. The Lions started out slow and missed many shots, but managed to stay close throughout the game. With 10 seconds left in regulation, the scoreboard showed a tied game of 49-49, but the Lions weren’t ready to give up. David Saginor (‘19) inbounded the ball to Yoni Rothberg (‘19), who then passed the ball to Eitan Warburg (‘19). Warburg channeled his inner James Harden by creating space for himself with a slight crossover and step-back, then taking a shot that went straight into the net, beating the buzzer and scoring the win for MTA. This win left MTA with a 2-0 record and secured the team’s spot in the semifinals. The Lions headed into the Shabbaton part of the Sarachek tournament in extremely positive spirits. Shabbos was filled with ruach and inspirational speeches from Yeshiva University basketball coach Elliot Steinemetz, former NBA player and brother of JR Smith Chris Smith, as well as his agent Daniel Hazan. The Shabbaton was a well-deserved break from basketball for every team and on-court rivalries became off-court friendships. 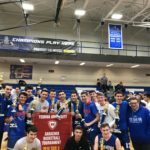 Once Shabbos ended, basketball started up again and the Lions were back on their mission to secure a championship. On Sunday, MTA continued their winning streak with a 66-62 win over the Posnack Rams in the semi finals and were ready to take on the championship. On championship Monday, the Max Stern Athletic Center was filled to capacity with MTA fans who wanted to win the championship almost as badly as the players. The entire student body and faculty came out to support the Lions with tremendous school spirit. The Lions started out against the Fasman Yeshiva defense and at the end of the first quarter, Fasman was in the lead 16-4. With not only the championship on the line, but also the naming of Coach Weissberg’s baby, the Lions continued to fight back until they achieved success. Both teams fought hard, but the Lions came away with the win. As the final seconds ticked off the clock, MTA fans stormed the court, as their team defeated the odds and went a perfect 4-0, winning the Sarachek Tournament Tier II Championship. Special shout-out to Yeshiva University for hosting a truly amazing tournament, as well as to the Lions’ coaches, Coach Weissberg and Coach Weisel, for a great tournament run and a great season. Congratulations to Hudy Weiss (‘19) for being named to the tournament all star team, Eitan Warburg for being selected to the all-tournament second team, and to Eitan Pfeiffer (‘19) for being named Tier II MVP. These 3 Seniors, along with Seniors Avi Wolk, David Saginor, Yoni Rothberg, Joey Hernandez Burg, Ephraim Greenberg, and Micha’el Shloush have been great teammates as well as great role models for the Juniors on the team. A special thank you to Coach Mark Weisel, who is retiring from his position as MTA’s basketball coach for the past 14 years and has been an extremely vital part of the Lions, both past and present. Now all the Lions need to do is vote on the baby’s name.